Imagine a new species of dinosaur was discovered. Imagine you are a world renowned paleontologist and used all your scientific skill to recreate the beast and work out how it was adapted for life in the Jurassic or Cretaceous eras. Check out our dinosaur models below. Each has specific adaptations that make it suitable as a carnivore or herbivore. Predators have big jaws, crushing teeth and powerful back legs. Prey animals have defensive spikes and horns. Leah's has a bony sail that allowed the creature to take in warmth from the sun more readily. Enjoy! In breaking news, drama unfolded today as daylight robbery occurred literally in Westfield's ALPS. Y6F were happily discussing reasons to write when a cloaked figure ascended upon them. In seconds this masked and armed brigand had held Lady Cosgrove at gunpoint, relieving her of her priceless jewels. What a catastrophic situation! Fortunately the thief was apprehended and whisked off to court. But is he guilty or somehow innocent? Enjoy seeing two of our best court summaries: one for the defence, one for the prosecution. The boys were put on the spot to do this but I hope you get a feel for some of the excellent language. What an amazing time was had at Winmarleigh Hall! Fears were conquered, challenges were met and memories were made. We'd like to invite you to share in some of them. Enjoy! Welcome back. With summer here at last Y6F has been sizzling this week. In English we continue to use the Highwayman poem to inspire our work. We have drafted up a narrative version (which will be proofed and improved next week), created acrostic poems that summarise the story and produced stunning 3d artwork featuring the dashing hero - check out below. In maths we have been solving multi-step problems, using reasoning to decide on what calculations are needed and what methods can be used to arrive at a solution. There has been impressive work. In topic we have produced leaflets to inform and persuade readers to visit the ancient Mayan ruins of Chichen Itza in Mexico. Certificate winner this week was Jamilah for super work in maths. Don't forget it's Winmarleigh Hall for many on Monday. Pack some sun cream. Mums - pack some tissues for waving off! Welcome back to another blog. This time we are going to celebrate and showcase some of our artisitic and creative talents. In maths we have been exploring circle patterns and how to draw them with a pair of compasses. The effects have been amazing and we were able to use some of the techniques we learned to create flower petal designs of different sizes, that when glued together made beautiful flowers. Just for you (see below)! In French, Mrs Wilson challenged everyone to draw the Eiffel Tower. That was challenging but three winners were chosen. Think you'll agree they are quite something (see below). P.S. Also, we've just walked for life. We raised money and had fun doing it. Check out the photos. What an intense and challenging week it has been for all in Year 6 this week! However, SATS are now over and the children can enjoy a more varied last half term and a bit. We are all very proud of how the children have given their all in some very demanding tests that all children found very challenging. Next week will see the return a significant focus on improving writing skills as schools have several weeks before final decisions on attainment in writing need to be made. In Y6 we like to thoroughly scaffold and support writing in order to teach sophisticated techniques with which to hook readers. As with other areas, it is a real challenge to consistently write to the high standards that are expected of Y6 children. But we are up for it! Today, the children were given the challenge of entering our outdoor area (ALPS) and collect natural materials with which to make collages. As you can see below, creativity is another area in which the children excel. SATS preparation has dominated proceedings in Y6F this week and rightly so. The children have undertaken and fully reviewed practice papers in reading, spelling and grammar and maths (arithmetic and two reasoning papers) and are hopefully peaking at just the right time. The actual tests next week follow a strict timetable with reading to be done on Monday, spelling and grammar on Tuesday, maths across Wednesday and Thursday. In between we will be able to revisit tricky areas to give our children the best support we can. It's going to be so important that the children are well rested so plenty of good nights' sleeps are a must. There is no denying that this particular time in Y6 is rather intense so as to act as something of a pressure valve, we designed our own SATS MONSTERS. Check them out below. They don't scare us!!!!!!!! Check out our advisory posters we have produced as part of our science work. In "Living Things" we have learned how micro-organisms can be helpful and harmful. Our posters definitely show the harm they can do. Well, SATS preparation dominates the goings on in Y6F at the moment, of course! It's very much hands to the pump to get the children as prepared as they can for these important tests. Indeed, in English, we have worked through both reading and grammar papers recently to identify areas that may need further development. Grammar, in particular, is very challenging! In topic we argued whether modern schools should bring back a Victorian approach to school routines. While nobody agrees with canings, some children could see the benefit of the Victorian system. Firstly, a big thank you and a well done to everyone for attending parent's evening. We had 100% attendance. Your support is invaluable! In English this week we have started to look at formal language as Y6 need to be able to choose formal expressions in their writing when it is appropriate to do so. For instance, rather than say ....... shut the door, pal, it would be more formal to say .....patrons are requested to close the door. In maths we have been interpreting different ways of representing data such as bar charts and line graphs. We have also found out how to calculate the mean average (add and divide by how many). As well as that, many children have worked on how to construct accurate pie charts. In science, as part of Living Things, we have introduced the work of Edward Jenner who discovered the vaccination for smallpox by observing that milk maids who contracted cowpox never seemed to catch smallpox.. This week has been a tough one for Year Six as we have given all children the opportunity to test themselves against how the new look SATS will look. They are of increased challenge than ever before and that is the same for all Y6 children throughout the country. It will be good to see you all at Parent's Evening next week where progress can be discussed. This week has seen us host the book fair. On Wednesday, Y6F spent a lovely short while as reading partners to some of our younger children. Why not take a look? Check out our book covers below! Well the half term is upon us and the children (and staff) will hopefully get a well earned rest. This week in English we have focused heavily on the 2 Rs - reading and wRiting. The children drafted, redrafted and wrote a final draft that recounted their day out at Quarry Bank Mill. This was backed up in topic with a story featuring Oliver Twist who, having become lost on his way to London (very lost indeed), was taken in by none other than Mr Greg, kindly owner of Quarry Bank Mill, who took him in to become an apprentice mill worker. Maths has been about measures: namely length and mass. We have to know the relationships between different measuring units and convert between them. For instance 270cm is the same as 2.7m! This half term's science topic has centred around the circulatory system and health. The children have looked at the health risks of prolonged smoking. Take a look at a selection of our advisory posters. They deliver a clear message, don't you think? Hi! Just back from a fabulous day out at Quarry Bank Mill where we spent the day learning how it was to be a mill apprentice in Victorian times. Enjoy these highlights! Hello there and welcome back to yet another busy week in Year 6. Firstly a reminder, if you have yet to send in permission slips and contributions for our trip to Quarry Bank Mill, which is this time next week, please do so. In English this week we have spent time developing skills in reading that allow children to retrieve information quickly and find the relevant part of texts from which inferences and deductions can be made. We use a game called Fastest Finger where children have to skim read at pace and then scan into the word we need. Children are taught to do the same when answering a comprehension question by putting their finger on key words from the question. As well as this, we have used our class novel Gangsta Granny as the inspiration for some writing. Ask your children if they would like some cabbage cuisine! In maths we have concentrated on calculating percentages of numbers and quantities and have solved lots of problems including percentage increase and decrease. BUT REMEMBER TO ADD OR SUBTRACT THE AMOUNT!!!!!! In topic we have tasted gruel. Yuck!!!! We now know how workhouse orphans must have felt every day and how they must have longed for some variety. it was thin and lumpy and salty. Not very nice at all!! 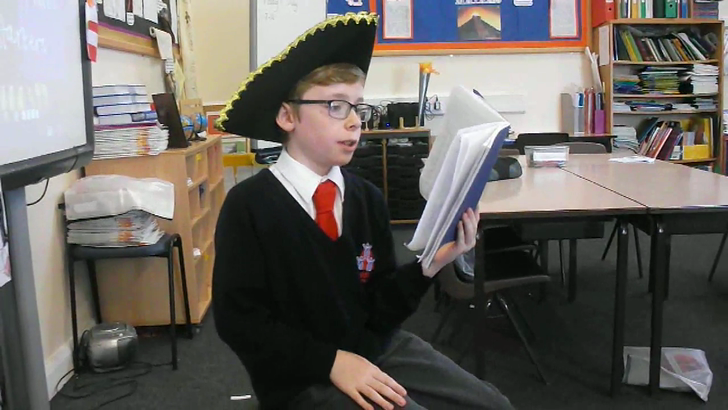 This week we have used the musical version of Oliver Twist by Charles Dickens as the stimulus to our new topic about Victorian life. We learned that times were very hard for the poor in those days and that the workhouse was where many ended up. It looked little better than prison! In English we have investigated how to add a suffix to words that end ---fer. We learned that if the ---fer part of the word is stressed when spoken then we must double the "r" as in refer ---referring. As well as that we have started to guide the children in strategies and techniques they will need to use to achieve their potential in reading comprehension. SATS will be upon us all too quickly. In maths we have revised how to calculate fractions of groups and quantities. Divide by the bottom, times by the top is the key idea. The children also completed a fractions assessment which helped to identify some areas that needed having another look at. Year 6F have settled back into school well and with so much rain they can be pleased with how calm and settled they have been. In English we have started Gangsta Granny by David Walliams and have used the text to draw out ideas about some of the main characters. We think it's going to be a great book to study. In maths we have been converting fractions to their decimal equivalents by dividing the numerator by the denominator. So for one eighth, one divided by eight gives us 0.125! In science we tested and evalued our electronic games. As promised, below are all our game boards. Want to play? Year 6F have had such a busy final week with all kinds of tasks needing doing: Christmas baking and crafts to electronic wizardry, it has been jam packed. Keep your eye open for future BLOGS where we will show you our finished electronic games. They all work so well. Who needs Xbox and iphones? A huge well done to Eleanor for winning the final certificate of 2015 for having an outstanding term. All that remains is for us to wish you a very merry Christmas and a peaceful and prosperous New Year. Y6F are busy as ever despite the holidays approaching. It's work in progress but take a look at our electronic games so far. I know what I'd get for Christmas! Well done to Kian for winning this week's certificate. He has had an excellent week. In space, no one can hear you scream!!!!!!! That was the tag line to the famous movie, Alien. Well, this week Westfield has had extra-terrestrial visitors who deposited what seemed to be some kind of egg. Oooo-er!!! This has sparked some wonderful reasons for writing this week with lots of descriptive work to do with strange creatures and out of this world locations. We have also enjoyed creating some amazing planets using modelling techniques, as well as experimenting with alien slime that could turn from liquid to solid and then back again! Enjoy some of our spectacular planets from a galaxy far, far away. Below are examples of what Y6F would say to bullies. This week has been National Anti-Bullying week and we're sure we deliver the right message. In English we have explored how to structure direct speech in narrative, basing our work on the Paper Planes film we saw recently. There was a super range of "said" words used such as - confessed, urged, whispered and more. In maths we have been strengthening our use of both short and long forms of calculating division. And now we are ready to use these methods to solve problems. What is clear is that not knowing tables facts off by heart is slowing some children down. It is vital that all children have this recall to speed up computation, so please encourage them to learn at home. In topic, we visited the fabulous city of Tokyo, the capital of Japan. Did you know that the population of Tokyo is over 13 million? This weeks certificate winner is Mark who earned it for applying his multiplication and division skills into solving a puzzle that shows he has a strong understanding. Well done to him!!!!!! Here is Ryan who proved to be a scientific genius this week. He was the first to find out if a bulb could be lit using one wire and a battery. He knew that if the bottom of the bulb touched the battery then there would be a complete circuit which enables the bulb to light. Amazingly, most children solved the same problem in science this week. In English this week we used all the super sentences we know to build a character portrait of Dylan from Paper Planes. Jake wowed us all by using vocabulary such as "potential." In maths we are continuing with methods for calculating division. Many of us have moved on to long division and are starting to get to grips with the standard formal method but it is tricky. We'll get there, however! In topic we have used the internet to research facts about Sydney, Australia because this was one of the settings for Paper Planes. It's a fabulous city and our guide books show this. Well done to Thomas for being Pupil of the Week in 6F. He works at a brisk pace and takes a pride in how it looks. Welcome back after a nice break but it's straight back into hard work in Y6. The first version is useful if mum wants to emphasise that Alice did it and make her aware of her actions. The second version is useful if Alice is already very upset and sorry and mum wants to avoid making her feel worse. Interesting, isn't it? In science we have started a study of electricity in which children will learn about variation in how components in circuits occurs. In topic we have started to look at capital cities, beginning with London. Today we visited the cinema to watch a charming film called paper Planes. This will inspire much of our work next week so watch this space. Enjoy our highlights of the week as we have indulged in the Great Westfield Bake Off and celebrated the end of the War. It has been a busy, fun and successful first half term. many thanks for your support. We are looking forward to seeing everybody's completed Learning Logs after the break. Get creating!!!!! Well done to us for having the best class cake as judged by our esteemed cook, Denise. And, well done to Ryan E for winning this week's certificate for his effort and attitude to writing. Firstly, many thanks to all the parents who attended Parents' Evening this week. It was lovely to see you all and hope you found your meeting informative and supportive. Super Sentence - Noun, which, who, where. In maths we have been developing and extending our addition and subtraction skills, both mental and written. We are now solving multi step problems involving both with large and decimal numbers. This week's certificate winner is Neve who has come back to us like she's never been away. Wonderfully! In English, we have drafted a letter of application for our dream job. We aim to proof and improve them before entering them into a competition organised by the Royal Mail. If it was up to me I would employ the class as they are very persuasive and have an array of talents, or so the letters say! In maths we have looked at developing mental and written addition calculation strategies. We can add large numbers and those with mixed decimal places. In topic we have created some poems depicting the Blitz. 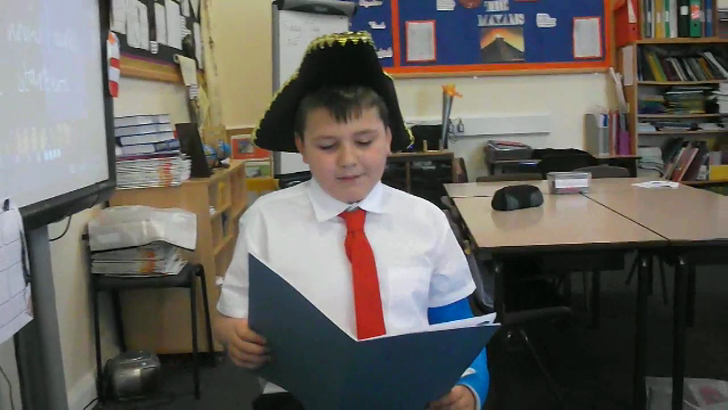 We were inspired by Private Baldrick from Blackadder who recited a spectacular poem about German guns. As well as that, we haver had a go at drawing caricatures of well known leaders during the war. Well, October has crept up on us without any warning, hasn't it? Also, check out our descriptions below. We drafted then proofed and redrafted. Look great! In maths we continued to work on place value, ordering and comparing numbers to tens of million and decimals to 3 places. We learned that putting zeros at the end of decimals so that they have the same amount of decimal digits really helps! In topic we have been learning about the roles of women in World War II. We didn't realise they kept the country moving and offered so much to the war effort. This week's certificate winner was Eleanor who sets a superb example on a daily basis. In English we have investigated 8 important parts of speech. Do you know what a determiner is? We do! Can you identify the verb or pronouns in this sentence? This is just part of the grammar work Y6 are expected to do. In maths we are looking at place value. Many children are reading and writing numbers to an amazing 10 digits. I can't even imagine numbers so huge. In topic we have watched and reviewed Goodnight Mr Tom a film version of a story about an old man who has to take in a evacuee during WWII. it was very touching. Check out our reports. Don't they look super! This week we in English we used a charming short animated film called Partly Cloudy to inspire our writing. We used an Imagine 3 sentence to help set the scene and later an Ad same Ad (with a simile) to establish characters. The results were very pleasing. There is potential for our writing to really come on. In maths we have investigated the properties of 3d shapes. We have drawn and constructed them using nets and visualised 3d shapes from 2d images. So we know our octahedrons from our dodecahedrons. In topic we have written a fact file that gives key information regarding the war and investigated who were friends and who were foes - the Allies and the Axis Powers. Well done to Kenzie for winning the certificate. He's settled very well into Westfield. The images below include the 3d shapes we've made and the beginnings of our computing task where we will animate a scene from the Battle of Britain. In Maths we have been investigating 2d shapes. Do you know what parallel and perpendicular mean? We explored our ALPS to find out what shapes are out there. Check out the pictures below. In Topic we're all stunned because Neville Chamberlain, our Prime Minister, has just declared war with Germany and we are so worried about our family, especially our dads, brothers and male carers. What if they have to go and fight? As you can see we are studying WWII, with particular reference to the Battle Of Britain. Exciting!!!! Y6F have made a great start and very much look the part (very smart). These first few days have very much been about establishing routines and setting out the expectations of Year 6. We have high hopes that they are going to make us very proud and achieve all they deserve. Take a look lower down to see the class in all their glory. PE day is on Friday. We will shortly be asking you to fill in a form advising us as to your preferred hometime arrangements. Would you like to collect them from class or allow them to walk home on their own? Please note that children who are collected must be done so at the class doors. If they are to be met en route then that is fine but you must choose that they can walk home on their own. The Y6 staff are always available at doors open and closed times if you need any assistance. PS - Well done to Millie for winning the first certificate for her perfect punctuality!!!! !